Home › Top › Wednesday, Ibiza.. party time at Bambù with Julien tax! Wednesday, Ibiza.. party time at Bambù with Julien tax! Tomorrow, Wednesday 23th of April, at Bambu’ Ibiza (Carrer ses Paradis, Ibiza centro) a new appointment the cult aperitiv-dinner created by Julien Tax! The program of the party, that will start at 21,00, will include a free buffet! 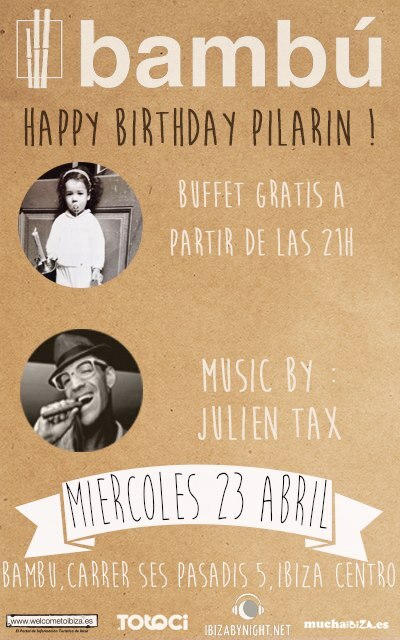 The soundtrack of the night will be by our friend Julien Tax!! Here you have the poster of the event with all the details! ‹ Tonight..Ibiza.. it’s time of Loop at Moma!